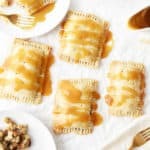 If you’re burned out on Thanksgiving leftover turkey sandwiches, I have the perfect solution for you—Thanksgiving leftover pop tarts! They are exactly what they sound like. Flaky, buttery tarts stuffed with turkey, mashed potatoes, dressing, and cranberry sauce. The best part? The warm gravy drizzled on top. Yum! 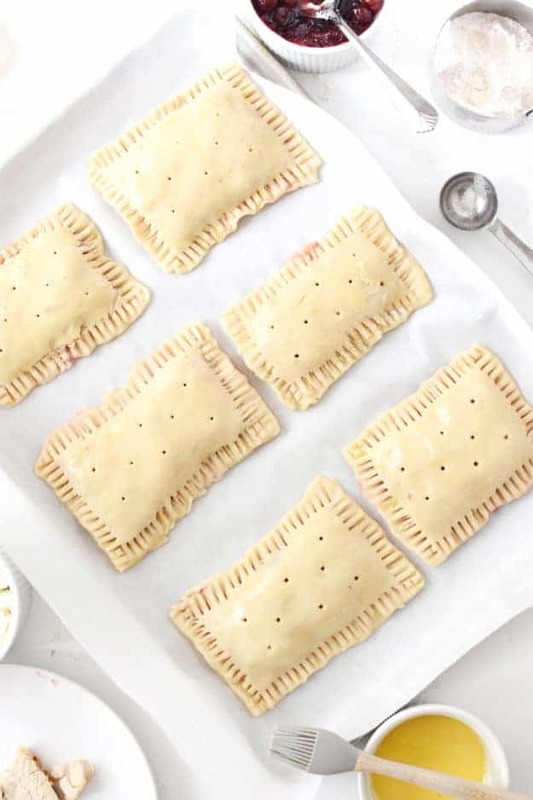 If you have extra pie dough, you can even use that to create the outer pop tart shell. I love developing recipes that reuse leftovers. Waste not, want not, amigos. Stuffing. Cold leftovers are MY FAVORITE. Leftover turkey. It’s a good way to eat it warm! Cranberry sauce. 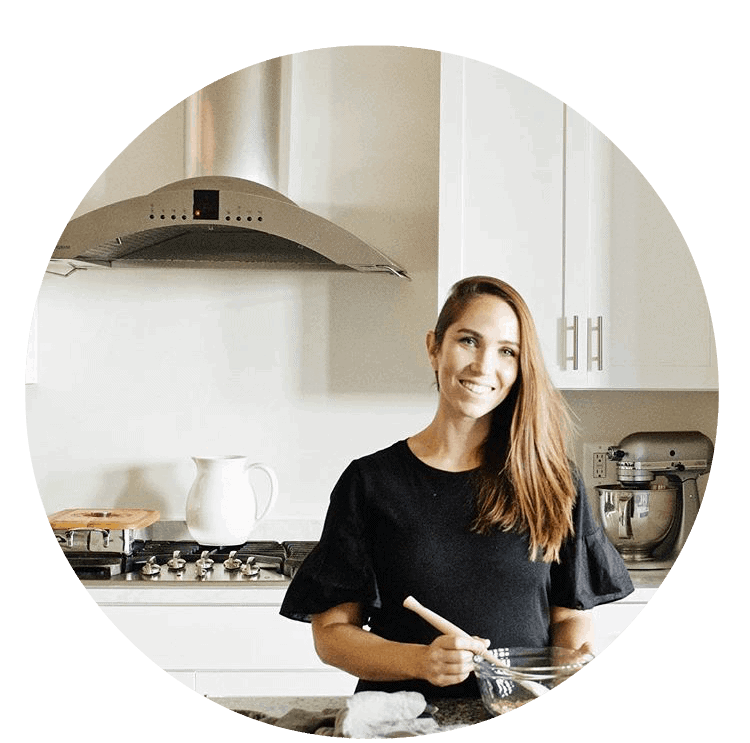 I have a super secret ingredient, perhaps I should share the recipe! Leftover mashed potatoes and gravy. Mmmm. Assembling the pop tarts is the fun part. Crank up the tunes and get your hands dusty with gluten free flour. Make sure you have a large enough working space to roll out your dough. 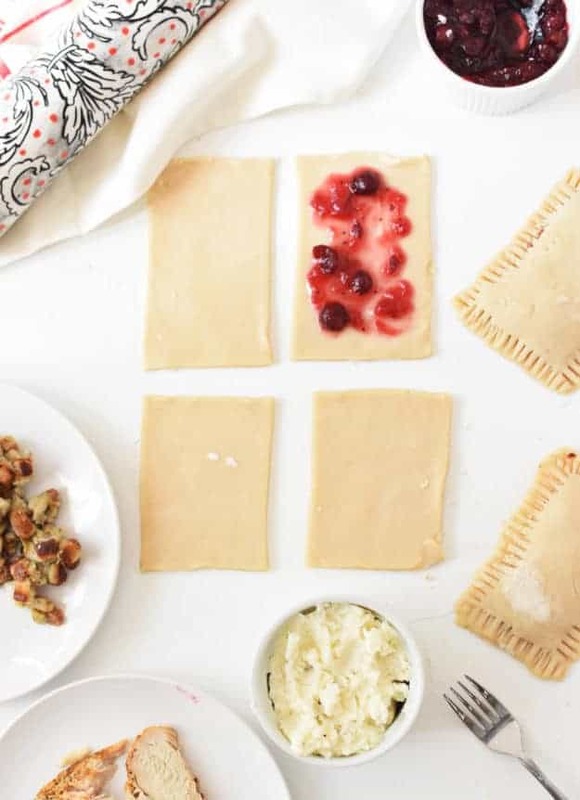 The recipe makes six pop tarts, so you will roll out 12 rectangles. Once the pop tarts are prepped and beautified, make sure you poke holes to allow in steam. This creates a warm and moist inside. I simply use a large toothpick to make the holes. And voilà! 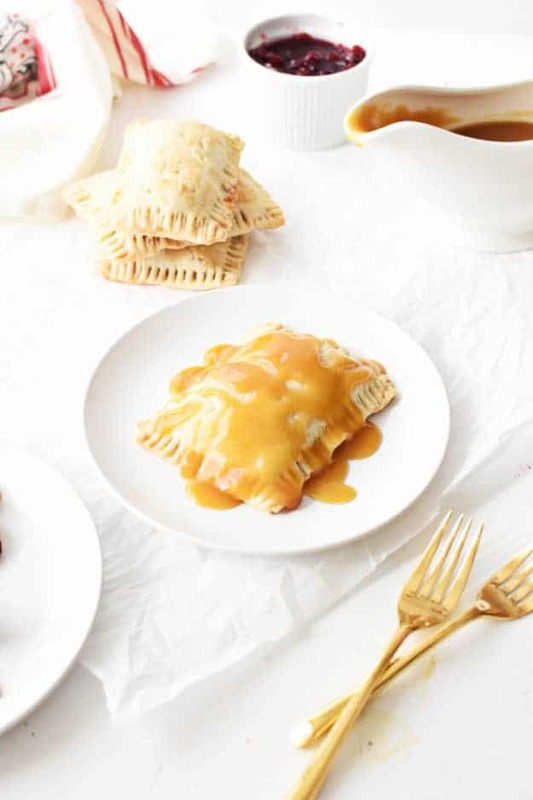 Look at those golden Thanksgiving leftover pop tarts! The ultimate indulgence, and the perfect lunch or dinner. Grab the recipe below. Enjoy! If you're burned out on Thanksgiving leftover turkey sandwiches, I have the perfect solution for you—Thanksgiving leftover pop tarts! They are exactly what they sound like. Flaky, buttery tarts stuffed with turkey, mashed potatoes, dressing, and cranberry sauce. The best part? The warm gravy drizzled on top. Yum! Pour the flour, sugar, cold butter and shortening into the bowl of a food processor. Pulse it about 12 to 15 times, or until the butter is pea-sized and the dough looks crumbly. Then, slowly add in the ice-cold water, pulsing the food processor until the dough pulls from the sides into a large ball. Be careful not to over-mix. Roll out the pie dough into a large rectangle measuring about 28 inches x 12 inches, and about 1/8 inches thick. Cut off the excess edges using a pizza cutter. Next, cut the dough into 8 rectangles that measure about 7 inches x 5 inches. Roll out the excess scraps into a smaller rectangle that's about 14 inches x 10 inches, and cut out 4 more rectangles. You should now have a total of 12 rectangles. Place them on a baking sheet lined with parchment paper, cover and chill in the refrigerator for 1 hour. Preheat your oven to 350°F. Remove the chilled rectangles from the refrigerator, along with your Thanksgiving leftovers. Spoon 1 tablespoon of cranberry sauce onto a rectangle. Then, layer on 1 tablespoon of mashed potatoes, 1 tablespoon of stuffing and small bits of turkey. Cover the tart with another dough rectangle, and pinch the edges together to seal. Repeat this step with all of the rectangles until you have 6 pop tarts. Use a fork to make lines along the edges of the pop tarts (cut off uneven edges to make a clean edge, if desired). Place the pop tarts on a baking sheet lined with parchment paper. Use a toothpick to poke several small holes in each pop tart to let the air out when they bake. Beat together the egg and 1 teaspoon of water in a small bowl, and apply an egg wash on each tart. Bake on 350°F for 25 to 30 minutes, until golden brown. 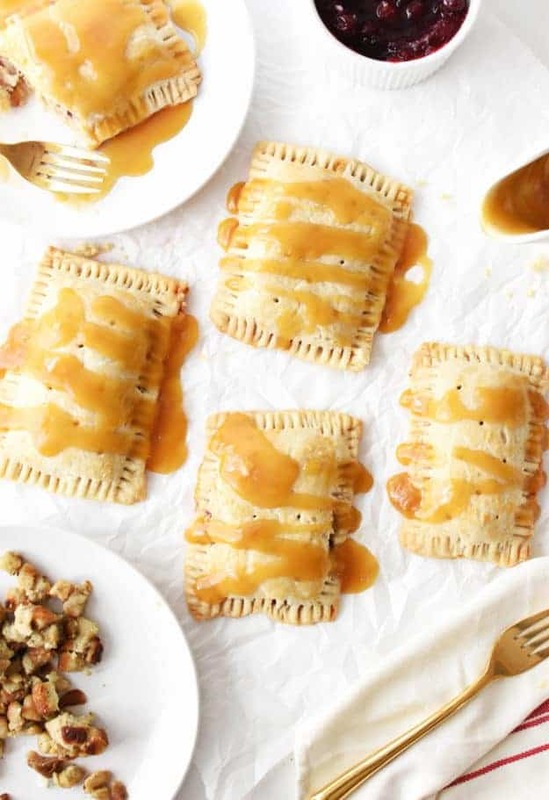 Once the pop tarts are done baking, drizzle them with leftover gravy that's been reheated. Serve while warm and enjoy!